Our BLEED PURPLE t-shirts have been a huge hit this year with both our Spring and Fall Predators and it's been AWESOME to see them worn all around KW!! We're half way through the Fall season and with t-shirt weather in the forecast for at least the next week or so it's time to show Waterloo Region our PREDS PRIDE and what it means to BLEED PURPLE! 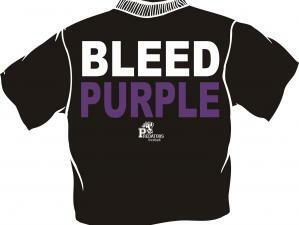 Introducing our "PREDS BLEED PURPLE" t-shirt competition with a $50 National Sports Gift Certificate up for grabs! 3. We will share the pics to our Facebook and Instagram pages. Make sure your pics are set to public so we can see them!! So get that Bleed Purple swag on and get snapping! The more creative the setting the better!! Let's see all the places PREDS BLEED PURPLE! !